Senator Antonio Trillanes, left, and Congressman Gary Alejano aboard the USS Theodore Roosevelt. Picture courtesy of Rep. Alejano. Two of President Duterte’s most outspoken political enemies were among the VIPs invited aboard the USS Theodore Roosevelt when it called at Manila Bay. 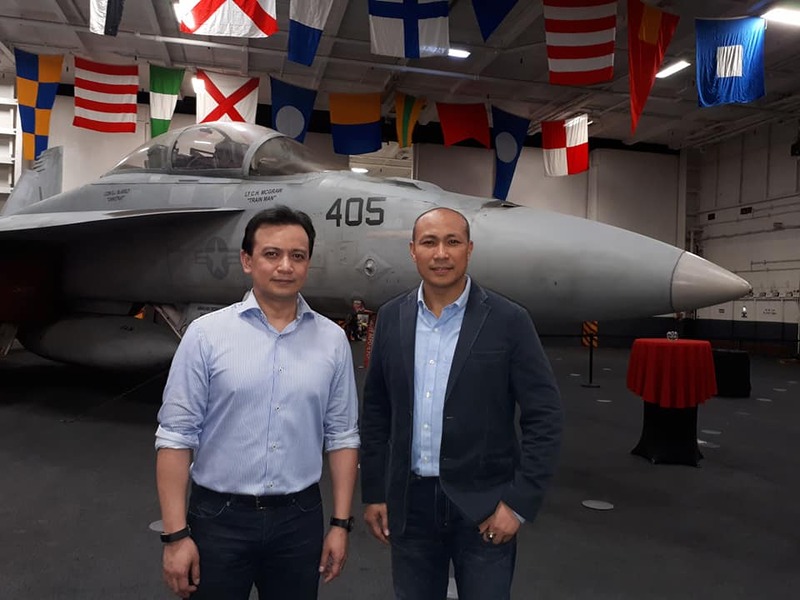 Senator Antonio Trillanes and Congressman Gary Alejano — both former military men with convictions for mutiny — were among the guest list for the aircraft carrier’s port visit last weekend. Senator Trillanes said the ship’s visit signified the USA’s resolve to challenge Beijing’s claims over the disputed South China Sea. Addressing the guests aboard the Nimitz-class carrier US Ambassador Sung Kim described the visit to Manila Bay as a clear message that the US-Philippine alliance was “unbreakable”. “Well, over a thousand feet long and weighing in at well over hundred thousand tons, sticks don’t come any bigger than the Theodore Roosevelt. “But I might take exception to the first part of the Teddy Roosevelt saying about speaking softly. I think there are times when we should speak loudly and clearly. “And the presence of the Theodore Roosevelt here in Manila Bay sends a very clear message to everyone in the region, especially to our friends in the Philippines because our commitment to the US-Philippines alliance is unbreakable and will remain so indefinitely. Other VIPs onboard included Executive Secretary Salvador Medialdea, Supreme Court Senior Associate Justice Antonio Carpio, Congressman Reynaldo Umali, Ayala chairman and CEO Jaime Augusto Zobel De Ayala, and former Army spokesman Major General Restituto Padilla.